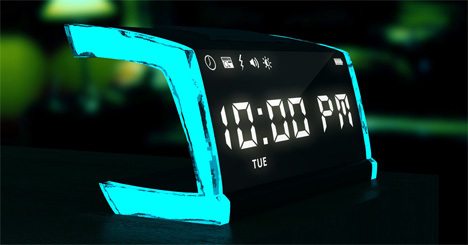 If you’re the type of person who can hit the “snooze” button a few dozen times in the morning and regularly find yourself late because of it, the singNshock alarm clock is an electrifying solution. Conceived by designer Sankalp Sinha, the concept is a simple but effective one: use a jolt of electricity to get people out of bed. The singNshock works just like a regular alarm clock: it displays the time, and when it’s time to wake up it plays your choice of music. But when you reach for the button to turn the alarm off, you are treated to a tiny shock. It’s only a few millivolts of electricity, so it’s not enough to actually hurt. According to the designer, this tiny bit of electricity is just enough to stimulate neurological functions. You have the option of turning the shock function off, so if you don’t feel like being jolted awake you can rely on just the sound and colored lights from the streamlined modern clock. The singNshock is only a concept at the moment, but Sinha is looking for support to turn it into a marketable product.